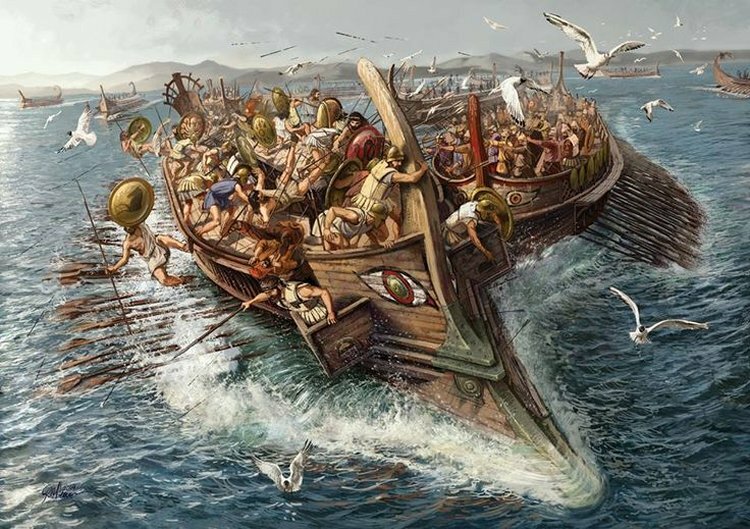 At about this time of year 2410 years ago the Athenians won a victory in battle at sea that was one of the most surprising and spectacular in their naval history. It became, also, one of the most painful and shameful events in the political history of the Athenian democracy. In wargame terms it is an interesting battle because the two sides involved are relatively balanced and the outcome by no means certain. In addition, our knowledge of the battle is limited and this gives many possible iterpretations of the original engagement to allow many different refights. I will not go into detail on the circumstances leading to the battle or the subsequent controversial events. These can be found in any book on the history of the Peloponnesian War. There is more than enough meat in just detailing the battle. This is not a totally prescriptive seanario but I have tried to include all necessary detail sfo ryou to make your own interpretation too. An Athenian fleet of 150 ships had been assembled at Samos at short notice to come to the relief of thier forces blockaded in the port of Mytilene on Lesbos and overnighted at the Arginusian Islands to the south. 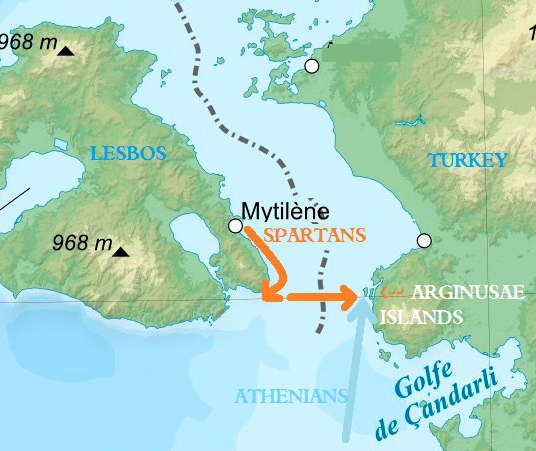 The Spartans and their allies had a fleet blockading Mytilene but their main force; of 120 ships, overnighted at Cape Malea, the southernmost tip of Lesbos, intending to face the oncoming Athenians next day. DETAILED ORDERS OF BATTLE ? We have no detailed list of ships and personnel for the battle but we have more information on the Athenians. 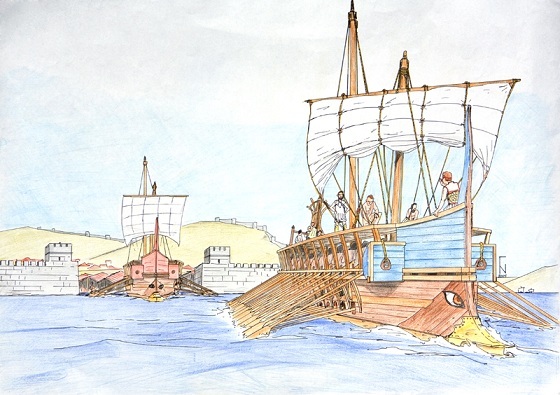 The Spartan fleet probably included many mercenary rowers and crews paid for with Persian money. Some proportion must have been from the Spartans and their key allies but at this point in the war they had atttracted many professional seamen from wider afield by offering bette pay than the Athenians. In addition. because the main Athenian fleet had been defeated and blockaded into Mytilene we can infer that the Spartan side had better quality vessels. Trieres were divided into three classes according to their seaworthiness: 'Fast' ships were more agile and speedier through the water, 'Slow' ships were more sluggish to accelerate and turn. The remainder had unexceptional performance. The Spartan fleet had dEmonstrated its ability by defeating the Athenian fleet outside Mytilene and we can surmise it had few inferior vessels or crews and maybe a preponderance of the best classes. 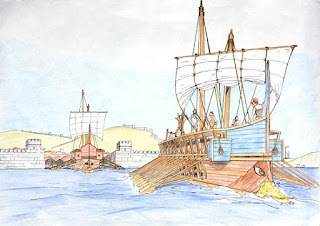 The Athenian fleet was a triumph of ad hoc organisation. Upon getting word of their fleet's plight the city had mobilised everything which was trieres-shaped and had positive bouyancy and found crews made-up of slaves, shopkeepers and even the upper crust. The ships from Athens were supplemented by allied ships and any Athenian vessels at liberty in the Aegean. There were 150 ships in the following groups. ATHENIAN SHIPS ( many would be rated slow and have inferior crews) 60 or 90 in 8 squadrons. ALLIED SHIPS 15 in all ? ( 10 from Samos and other allied contingents). Probably competent crews. After an intended night-attack was called-off due to bad weather, the Spartans put out to sea probably at first light and sailed directly over to the Arginusian Islands to meet their opponents. The night attack and the purposeful approach were typical of Callicratidas, the Spartan commander. He was a Spartiate and went by the book. Attack and win or die fighting. 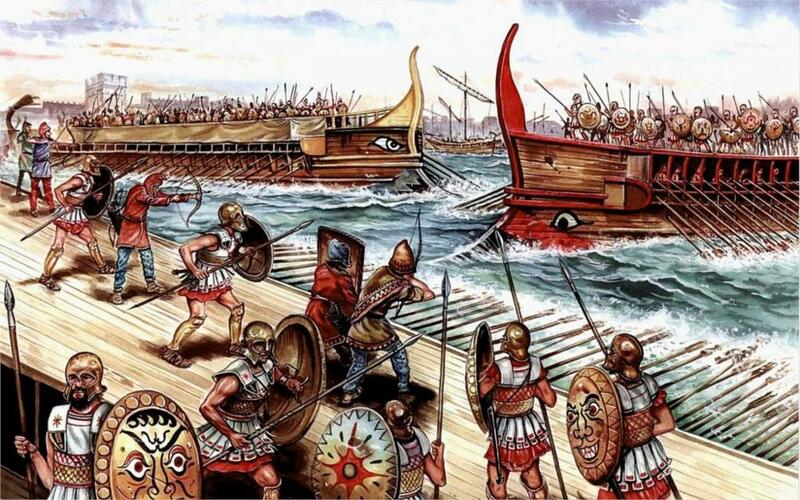 He hoped to hold the initiative and destroy the Athenians before they could unite witht the 38 ships in Mytilene. Callicratidas cannot have seen the Athenian fleet across 18 km of sea. he may have had some intelligence from fast scouting craft. In any case, he probably set out before the Athenians were at sea. The 120 ships cannot have crossed the water in line-abreast because the formation would have fallen into disorder rapidly as different crews maintained slightly different speeds. Most probably, the squadrons making up the line each proceeded in file, led by their commander, intending to come up to form a continuous phalanx as they approached the enemy. Callicratidas was leading the rightmost squadron as was the usual practice. It is significant that Callicratidas cannot have known the exact disposition of the Athenians. Once he was close enough to see details his options for rearranging his line or for issuing new orders were very limited. The contemporary writer, Xenophon, tells us the Spartans intended to use their superior capabilities to use diekplous and periplous tactics against the Athenians. These tactics involve using speed and sea-space to penetrate and circumvent the enemy line. To this end, the file formation of the Spartan squadrons would be well-suited. They could approach at top speed and glide through spaces identified in the enemy ranks. Diodoros Siceliotes, writing hundreds of years later, says that the Spartan fleet was divided into two to match the Athenian disposition - the left half being commanded by a Theban general. He is, however, a creative writer guilty of sometimes inserting credible but anachronistic elements into his histories. Best to ram anywhere except head-on. The Spartans may have approached in file and then swung into line to form a solid phalanx to face the enemy before engaging. In any case, the Spartans found themselves facing a novel Athenian deployment with little chance to equivocate or reorganise before joining battle. A Spartiate general would not have been well-disposed to do either, especially when he was confident that he had the best materiel for the fight. 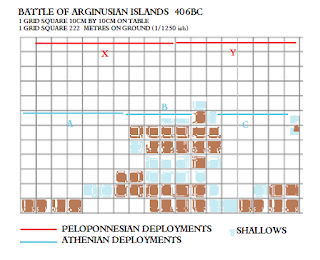 The Athenian fleet overnighted on one of the Arginusian Islands. The commanders cannot have had so much intelligence as the Spartans because they had approached from the south into areas dominated by the enemy and Callicratidas was confident enough to consider a surprise attack after the Athenians had anchored for the night. The islands were, however, colonised by Athenians and watchers from the cliffs would have sighted the oncoming enemy fleet soon after it put to sea. Crossing the intervening waters at an easy 7 knots so as not to be exhausted for battle, would take the Spartans an hour or so. The Athenians had eight naval generals present and in concert or under direction of the day's Commander-in-Chief, they deployed their forces in a way designed to compensate for their inadequacies and neutralise the Spartan advantages. The key feature of the disposition was that the ships formed in a double line. In this way any enemy vessels seeking to penetrate the battle line and make a rear attack - as was the aim with diekplous and periplous tactics - would be intercepted and neutralised by the reserve line. 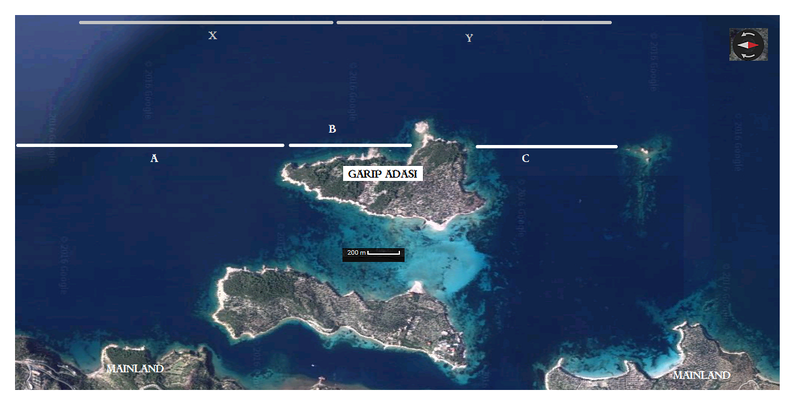 The second feature was that the island of Garip Adasi may have been incorporated in the Athenian battle line to disadvantage the Spartans. One possibility is that the Athenians deployed with half of their fleet north and half south, of the island. This would cause the Spartans to divide or else stretch their line to cover a broad front. The breadth of line the Athenians lost by deploying in depth would then be compensated-for. The second possibility is that the Athenian centre was lying in front of the island. In this way the weak division would have its rear protected from an enemy break-through. In both of these scenarios the islands and the shallow straight between them create a barrier to any enemy ships moving along the rear of the Athenian line if one flank was defeated or penetrated. The third possibilty is that the battle was fought out to sea away from the islands which did not play any significant role in the battle. The incorporation of Garip Adasi in the battle line is inferred from Xenophon's account and Diodoros' comment that the Spartans divided into two to try and match the breadth of the Athenian front. The ships manned by the naval officers - the nauarchs and the taxiarchs - should be of fast or better qaulity- The Samians and allies hsould be at least standard quality and maybe also fast/better. The general Athenians standard must be lower. Dice for each squadron as follows. Division commander's squadrons always Fast/Better. The players make a list of forces, dice and record quality scores for later proof ! The different interpretations of the accounts we have allow many variants for a tabletop refight. The following matrix outlines the possibilitie for 16 to 24 variants ! Each component of the matrix is explained below. The variants marked '?' are less likely to have occurred. FILES : Means they deploy in line-ahead. Equally spaced between wherever the ship of Callicratidas enters and the northernmost end of line Y. Each squadron is 10 to 15 strong and is led by a commander's ship. 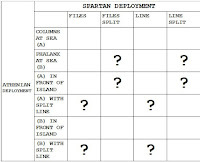 FILES SPLIT : Here the Spartans are divided into two divisions. The player can choose how many squadrons of 10 to 15 ships are in each division but smallest division must have at least 30 ships. One division deploys behind line X, the other behind line Y. One divison is led by Callicratidas, another by the Theban Thrasondas. LINES : Means the squadrons deploy in line to form a phalanx instead of files in line-ahead. Callicratidas must lead the rightmost file, Thrasondas the rightmost squadron of his division. Or, they can deploy freely within the division's allotted area. A final variant is to allow the Athenian to reaarange his squadrons within the divisions but he must have a minimum of 30 and a maximum of 60 in each division. Squadrons can be 10 to 15 strong. 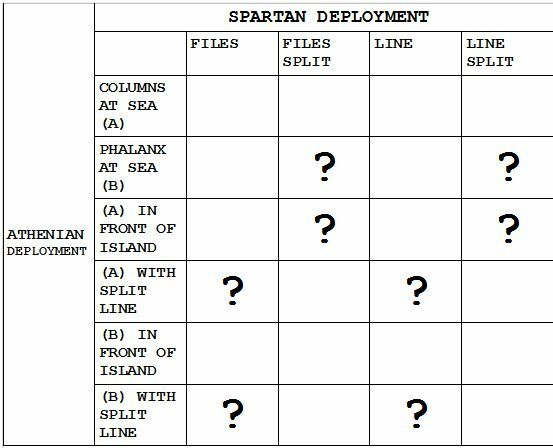 A) Means the Athenians must deploy forward of the white lines with the squadrons in file / line-ahead.. This means the island is not in their battle line. B) As A but squadrons equally spaced in line-abreast / phalanx. 'IN FRONT OF THE ISLAND' means that the Centre Division deploys on line B. This means they have the island at their rear. The left division deploys at line A, right at line C.
'WITH SPLIT LINE' means that the Athenian centre deploys on line A to the right of their left division. In this way the Athenians have deployed in two blocks separated by the island. Protomachus is considered the Commander-in-Chief. The Athenian player can select which deployment option he wants. Dice or draw cards to see which the Spartan adopts - but he makes a sketch map and only enters the board on turn 1. If you have fewer models scale the numbers down to 1/2 without too much change from the original situation. Many fewer models than this will give a less crowded seascape and a different situation from the original engagement. Alternatively, use the options with a split Spartan deployment and fight two battles. Indeed, Diodoros states that this battle was special because it was like two simultaneous battles, divided by the island. Here is the layout, plundered from Google. About 4,5km wide. Make the island 1200m wide. You only need the combat area to be represented on the table. Allow some space for further combat out to sea, maybe. The exact orientation of the battle lines is unknown. I have them facing east-west as the direct route over the strait from Lesbos. The lines ABC are the furthermost deployment for the Athenian divisions. The lines X Y are the entry zones for the Spartan divisions. Areas of turquoise/green water are shallows and rocks. All the western side of Garip Adasi are rocky coast and the island and mainland are 'friendly' to the Athenians. Here is a 6x4 table set-up.A larger table should give more space on the flanks and out to sea. The Spartans have a problem. Their better ships must be careful to achieve breakthroughs against the double line.They are outnumbered and so must Try to defeat one part of the Athenians before the remainder come up on their flank. If the Athenians are deployed in front of the island then, unless pinned, their centre can wheel out against either Spartan division. The Peloponnesians attacked with gusto and must have made some impression on the Athenian line. However, they were rolled-up from the left and, after Callicratidas was lost overboard - maybe as his ship rammed another - the battle degenerated into the usual dispersed chaos of trieres combat. The Athenians were victorious, even though they had a scratch fleet of inexperienced crews. This shows how much their deployment was crucial and the high level of seamanship that could be drawn upon from these Hellenes with salt-water in their veins. The Peloponnesians lost at least 70 ships with most of their crews. A terrific loss, but it was made good again with the help of Persian money. The Persians were determined that Greek naval power would not dominate their Ionian coast in the future and Athens must be curbed. 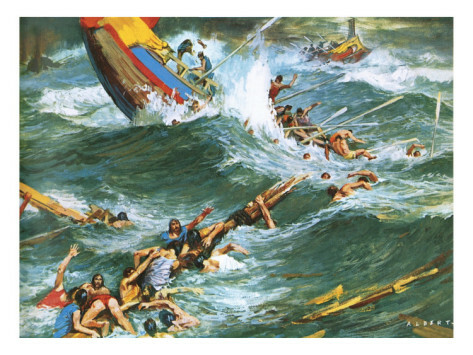 The Athenians lost 25 ships, leaving c.5000 men in the water. Unfortunately, the rest of the fleet could not come to their aid before bad weather intervened and most were lost. The postscript to this stunning victory was that the generals responsible were sentenced to death for neglecting to aid the survivors. So grateful could the Athenian demos be.